Once again, I had a great time in Tynemouth at the book fair. Despite it being generally a smaller market than last time, (I think many were away on summer holidays), it was still a busy day meeting lots of new people! The next book fair is Sunday 9th October 2011. That’s the last one for this year until next April 2012 (sounds ages away, doesn’t it), so do come along and ask any questions about your objects. I’m going to bring along a few materials next time as many of you expressed an interest in seeing what sort of tools, papers and adhesives we use in paper conservation. It may surprise you that many of them look fairly basic but what is key is understanding how they work, why they work and when is best to use them. Often those decision-making processes are the most important thing to our profession. 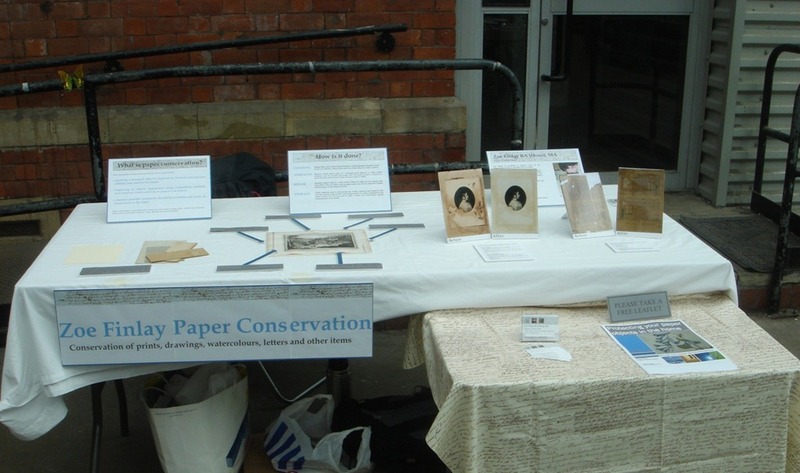 Below is a photo of my stall, this time without Polly Bird the bookbinder (see ‘Useful Links’ page) who was a bit snowed under with work to come along this time. Bye for now, look forward to seeing you in October!